If your site is not search engine friendly, you might be losing a lot of traffic that you’re not even aware of. Remember, besides visitors typing in "www.yourwebsite.com" and backlink referrals; search engines are the only way people can find your site. There are many benefits of getting a high ranking site. Let’s use ndesign-studio.com for example. I have, on average, about 14,000 visitors a day. About 40 – 45% of that traffic comes from search engines (about 6000+ referrals a day). Imagine, without search engine referrals, I would be losing thousands of visitors everyday. That means, I’m risking losing potential clients too. First, let’s look at how crawler-based search engines work (both Google and Yahoo fall in this category). Each search engine has its own automated program called a "web spider" or "web crawler" that crawls the web. The main purpose of the spider is to crawl web pages, read and collect the content, and follow the links (both internal and external). The spider then deposits the information collected into the search engine’s database called the index. I’ve seen this mistake many times where people put up just a big banner image and a link "Click here to enter" on their homepage. The worst case — the "enter" link is embedded in the Flash object, which makes it impossible for the spiders to follow the link. "Photo Tips & Photography Techniques for Great Pictures"
Hint: Properly describing your images can help your ranking in the image search results. For example, Google image search brings me hundreds of referrals everyday for the search terms "abstract" and "dj". Tip: You can promote the more important pages by inserting text links within body content. Make sure you use relevant linking text and avoid using "click here" (as mentioned earlier). To search engines, a www and	a non-www URL are considered two different URLs. You should always keep your domain and URL structure consistent. If you start promoting your site without the "www", stick with it. Please note that I’m not a SEO expert (although I manage to get very high rankings on all my sites: N.Design Studio, Best Web Gallery, and Web Designer Wall). The tips I share in this SEO guide are based on self-taught knowledge and years of web design experience. Fantastic article – raises some great points for new designers. Hi thanks for this good article, i still do some SEO but with the knowledge of this article i can do some more! I think the h1-Tag is not as important as h2, because h1 is often used for the title (Company Name, Blog Name etc.) or as replacement for the brand. I must admit I was in the 24% of people not knowing what SEO really is. That is until now. Your article has really given me a good insight into the topic and I will do my best to put all the tips in practice. Thanks a lot! Great article. I’m sick to death of hearing about SEO, but this is a good primer. thank you great article… good read! I was expecting more design orientated SEO tips. This is a good primer but my graphic designers aren’t going to make a whole lot of use of it. What specifically do designers need to keep in mind to make the developers job easier and better when it comes to SEO? Probably the best intro to SEO I’ve read, fantastic! Nice article, I’ve read many of these tip before but it’s good to have such a comprehensive list all in 1 place. Great article! I’ve always wondered how much a designer/coder can actually do to help with SEO. Now I know! Nice post for beginners, it is really accurate and complete. Great article, can only confirm many of the things you mention here! Wow, great article! Thanks a lot! Very usefull! Thanks for the great post! Very nice post Nick, you have done a really good beginners guide about SEO, this is really helpful for any designer. Hi there, from what I have read on the subject many people make this mistake with the alt and title attribute. I think it should read as follows. You should always describe your image in the title attribute. The alt attribute is what describes your image to a blind web user. Guess what? Search engines can’t see images so your title attribute is a factor in illustrating what your page is relevant for. Wow, very thorough! One thing I might add is external links to quality websites. Giving your users access to useful information outside of your site makes your site more useful, and search engines take notice. Thanks for the great article! Nice article! It explains the basics really well. Could you explain a little more about being consistent with your URL? This is the first time I’d ever heard of this. This is an awesome article. I’ve learned SEO very much the same way you have, through lots of research and experience. SEO really isn’t rocket science, and there are so many companies out there that want to charge clients and arm and a leg for search engine placement, which is really unnecessary if the site is designed properly from the beginning. I also HIGHLY recommend the Google Webmaster Tools, they are free and offer you so many ways to improve your search engine placement. Great article…very informative…love the poll too, really shows how many designers don’t know about SEO. …and the ones who don’t think SEO matters. I always find it so hard to believe when some of my graphic designer friends think it will be quick and easy to make a website with two things: a Photoshop file and the slice tool. People need to do some research before they throw together a website…might as well make your time and effort worthwhile – with great SEO practices. Thanks for sharing. I’ll try to fix my own. this article could not have came at a better time . i just had an interview with a place who.s looking for not only a front end web designer, but a seo professional . of course, as a web designer, i knew what seo stood for, however, since technology has changed so much, i wasn.t really aware of all these little things that help with the seo process . i appreciate this article more than you know .thanks . This is an awesome post. I think on-page SEO is a vital part of web design. such a great post about this blog.. for me, it’s also nice that you know atleast the basic seo in order for you to gain traffic. Our company does *not* offer any Search Engine ranking improvement services, however we can help you out with the SEO optimized markup or WordPress theme coding. At least On-Site SEO part is no longer a problem at all. Thanks Nick, its always a pleasure going through your articles. This article was a bit more special since I’m also digging into articles regarding SEO’s and I’ll surely follow the points that you’re focused. It’s a good post indeed.. Thanks for the great tips. As more of a designer than developer it can be tough to keep up with SEO, but this article is a great help. Nice Nick, I’ve been threatening to write up a post covering SEO for designers myself. It looks like you’ve done a great job! Watch this post for a bunch of spam showing up in the comments, anytime there’s an SEO discussion, that seems to happen, the spiders come out of the woodwork! This is a great article for beginners! I often have a hard time explaining the do’s and don’ts of SEO. This is very helpful! wow! awesome tutorial, and great tips! some of the things you listed must be “default” for every designer who is trying to work serious, but the other ones helps so much! thanx! another great article! A question about WordPress title tags: how do you change them? I went into the header template (header.php) in the default WordPress theme and found a dynamic title tag which I did not know how to edit. After reading your article, I would really love to change my title tag for each post on my blog but I don’t know how to do it. Also, can I write a custom meta description tag for each post too? Excellent post! All web designers should read it. This is definitely a great tutorial on SEO. Thanks! Man, wonderful post. I´m designing my new portfolio and this will be very usefull to me. Nice Article! Will be a helpful resource! Thanks! This is great! As a beginning designer, the idea of keeping up with SEO seemed a little intimidating until I read your fantastic article. Thanks! Thanks Tim! I just downloaded “SEO Title Tag 2.1.3” This is a huge help. Thanks! One point regarding AJAX loading content. I agree completely that AJAX loading should be used sparingly as it’s not spiderable content, but there’s absolutely no reason any developer worth their pay can’t parse the hash at the end of the URL on page load, creating a copy-pastable URL in the process. The unfortunate fact is that people can be lazy and they don’t take the extra couple of steps to get this done. wow..superlative tut!! oh, thanks for the MCTE V3 Component :-D lol…it’s great!! I was really shocked by those statistics, however not suprised. One of the key flaws in the design – developer relationship is SEO. This is usually an after thought and left up to somebody to try and turn the website that may look graphically creative and beautiful into something that a search engine can actually read. hey! thanks so much for this article. i’ve actually been trying to find a great source on SEO because, unfortunately, i fall into that bottom quarter of uneducated designers. not for long! I see you are accepting only convenient comments :) Pretty bad .. Thanks a lot for this tutorial. I’m aware of my responsibilities as a web designer/developer, but since my background is in graphic design it’s always nice to read something as clear and simple as your article. This post is great! Keep up the good work! Regarding the flash menus, when I decide to go with one on a site I make a second menu and put it somewhere on the page (in the footer for example, depends) just for the search engines. Great article! I’ve read that the TITLE tag is one of the most heavily ranked factors in determining search relevancy. Putting your page/post title first before the site title is important for search engine listings. You only have so much space (65 characters) before the title gets chopped off. That’s exactly what were doing with Spotobe by putting the event/location title first, before the site title. hey nick, good on all points. Indeed a lot of designers do not care about SEO . Another thing which i found during my research into SEO for clients, use of invisible for h1 tag can actually hurt your web site. Some people use h1 tag hidden/invisible when using image based page title. Great alternative to that is simply to use text-indent: -9999px; Something I learned from a fellow designer from design team i’m in. I am not really surprised that 24% did not know what SEO is because it is just becoming ‘mains stream’ over the past six months. In another six months I bet that percentage will be up to 50%. Thanks a lot for this article. This will help me a lot on my designs. Your posts are always informative. Keep it up! nice writeup… SEO I feel is mandatory when building any website today. Any website I build now is setup with what I call basic SEO. What I mean here is that I will do all the on-page optimization (h1-h6’s, tags, etc…) but I do not do any keyword research or off-page optimization. I let my clients know this and tell them that the site is built for SEO, so at any point if they feel they would like to invest more than it would be made easier since I have now laid out the framework…its just a matter of changing the keywords being used within the site. I feel there are different levels of SEO to offer clients (not all clients truly need seo or would benefit, certain industries don’t rely on the internet)…you got your basic, medium (keyword research, etc) and large (building external links to website, aggressively try to increase PR, analyze the competition that ranks for keywords you want to rank highly for and go that next step past them). I think there is one thing you can add… analyzing the competition that ranks for the keywords you are gunning for…this is huge and a great way to know how your competition got where it is and how to get past them. Thanks mate..this is what i’m looking for.. Very informative and right to the point for all designers,webmasters and in fact anybody wanting to increase their site presence. Thanks for you post,which so useful for me. Thanks so much for putting this together. This is a very helpful ‘how to’ I will be sure to reference frequently. Google can track AJAX’ed-in pages, it’s explained in their Google site map page. Amazing article! Thanks a lot! Thanks for this amazing post on SEO. Its really helpful as you have put it up as points and easy to go through the details. Great article..this is what i’m looking for..
Really great article! Thanks so much. I’m going to save this for future reference. The title of the page is very important in my opinion. Sometimes, people sacrifice usability for SEO, and then I think, “this search engine optimisation stuff is stupid.” But many of the practices described here happen to be good for usability etc. too — for example, splash pages are idiotic for reasons other than SEO disbenefits — so well done. great article. i’m actually an SEO that’s come from a design background and i am very happy to be seeing more designers take interest in SEO and realize that a lot of it starts with design. something i’d like to recommend adding to the Search Engine Position (page rank, doman age, etc) is content. while it may not seem like a design thing to be concerned about, a page of good content is highly important for visibility and placement within a SERP. it’ll help you can create url structures, title and description tags, you can also code the CSS so that the content sits higher so it’s found faster and it all backs up the keywords or phrases on the page. There’s some real useful into there. Like I never knew that a domains age would have an effect. Thank you. think i’ll print this article on my bathroom wall. very very helpful information here, thanks alot for sharing. I’m waiting and hoping for the day when web designers aren’t expected to be specialists at everything having to do with the web. SEO is its own specialty and, frankly, one I don’t find very interesting. As a result, I confine my concern with SEO to building SEO-friendly websites (and this article contains some great suggestions about that) and recommending an SEO specialist to clients who want or need that service. Most clients are grateful that I’m not trying to represent myself as having expertise that I don’t have (and don’t care to have). i learned a lot 4rm this article.. Awesome article. You covered a lot of ground and didn’t drag it on forever. One for the bookmarks. Haleluja, a designer that totally get SEO! This is a brilliant summary of what SEO is Nick!! Really good, and I’m Head of Search and write an SEO blog (seo-chicks.com). In fact I’m going to Sphinn this blogpost! cheers, it was a pleasure to read!! This is really great article! “You should always describe your image in the alt attribute” – this is not good advice. ALT is an alternate for when the image can not be displayed, and not simply a description of the image. If the image is purely decorational and has no semantics relevant to the main document then the alt attribute should be blank. This allows screen readers to hop right over it without reading a redundant description or an ‘image missing alt attribute’ type warning. But that’s the only thing I found contentions in an otherwise spot-on article. This is the best no-noncence piece I have seen on SEO. You might want to look at the SEO functionality on the Bitrix Virtual Lab at http://www.bitrixsoft.com/sitemanager/demo.php. They have the functionality you are commenting upon. The SEO its a way for sucess in the disclosure of your site. The Alt text on images sometimes shows up in the SERP descripton, if it’s pulling text top-to-bottom, so make sure you factor this in. Great article, I’ll be coming back often for review. Very useful, complete and well explained. A great article. @99 – I wonder if the remark in the original text meant more that you should never forget to put at least an ALT=”” on an image. Obviously putting ALT tags on purely decorational images (ALT=”Blue shading” for example) is completely redundant and a hindrance. Thanks for the article. I never really understood SEO until now. Just curious, what is the difference between using www or no www? Cause I haven’t been consistent. But I will try from now on thank you. Thanks so much for your great articles. Hi Nick, probably you don’t know me. But… Can i translate this guide as is and post on my blog (portuguese) and for sure give all the credits here? Thanks for the really great guide – everything all in one neat little package. Great Stuff. Hi, nice guide, however the points about Flash aren’t exactly true. Google’s spider (i.e. the only one you should really be concerned about) can crawl .swf files, indexing the text inside them and following the links they contain. You can see this by specifying filetype:swf in a google search. Very nice … I’m lucky in that I studied marketing for years as a solopreneur in a different arena before getting into web design. Your tips are sound; people would do very well to listen. I’d say you’ve shaved a few years off people’s learning curve, if they put into practice what you’re preaching! I was talking to a friend of mine who is a very competent flash developer and he was saying that Google is the only search engine that can index SWF’s the drawback is they have to be version 8 or better. Just wanted to add that getting your content onto dig.com and other social media sites is a great way to get incoming traffic AND boost your SEO! Thank you very much indeed for this great article, very easy write and explained in a high readability. Great Guide. I did know from SEO – I just didn´t know what it exactly is and I didn´t realy bother looking up what it is. Well as I see I´ve already done most of the things correct you have stated in your guide. I just left the alt tag on images empty. I am going to fix that asap. I have my site up like 3-4 months and a PR of 3 already. keep up the good work. I really enjoy your tutorials on flash,css,etc. Nice work. I have enjoyed your many tutorials on flash, css, etc. – Thanks for sharing your knowledge with the rest of us. Great article Nick! This is what I want to know about SEO! I’ll translate this article to Burmese Language if you don’t mind. WOW!!! Thanx. What a helpful article. can I translate this article and put it on my weblog ? Awesome and comprehensive article. Thanks for all the great tips and links! Another useful and informative article from web designer wall. Nice work and a good read. It depends what ones speciality is. If you are strictly a front end developer working only in Photoshop and not marking up anything, for example, then SEO is largely irrelevant to you. Design itself and SEO are 2 completely seperate things. If you do markup/page building then of course it is relevant. Although there is no excuse not to know the basics as it’s a easy to learn set of rules. Very very helpful article, most of the things mentioned I did know, but I also learned a lot from this aswell. Great Job! Really nice work. I am a webdesigner at first, but the “SEO-guy” in our company, too. So I know most of the problems and faults you mentioned above. Thanks very much for an informative and useful article. Great read! I just got a chance to browse through it, but I am for sure going to boomark this and come back to it. SEO is very important, and often overlooked. This as MANY very helpful tips. Thanks. Very good article! Thanks Nick! Great artice. Full of good sense. I’m also shocked at the number of developers who never give a thought to SEO. Surely these days it’s an integeral part of the job description? Unless SEO and copy are covered by a third party company. Seo experts from india providing cost effective seo services to our clients. Wow! Thanks for all that input. Now to implement. A really simple and effective guide. Thanks a lot for spelling it out and giving me some really useful tips! Although offsite SEO factors are important one should not forget the importance of good quality and fresh content on the website. In the long run adding regular new content will play a crucial role. Look at the rank of Article website and press release websites. Our own web design company website http://www.kronikmedia.co.uk initially saw good results after our on site and off site SEO campaigns. After a while however we were running out of new SEO techniques to try. In the second phase of our SEO Campaign we are concentrating on updating our website with regular, new , quality content. We have also set up a web design resources blog at http://www.kronikmedia.co.uk/blog mainly for this purpose. Very useful and informative, thanks. Thanks, very helpful and clarified a few things. Fantastic posting, keep it up! Great article. I think a lot of people do follow some of these, but like me, question if they are doing things the ‘right’ way. Good stuff. Cheers. Great post. All designers should keep SEO in mind. 6 Months down the line when you client isn’t seeing any traffic, they’re going to come back to you. Why not seperate yourself from other designers right from the get go! Well, I think it was mentioned in the comments before, but describing every image in “alt” attribute isn’t a good idea. Who the hell need information like “top border”? Certainly, such images should be backgrounds not <img>’s, but what I mean is: If the image has any attibution to the content of the page, it should have an alt, otherwise alt=”” should be your friend. As you pointed out, there are some very simple and basic ways you can improve your page ranks by simple design optimization. You don’t need to be an “SEO Guru” to help your clients (or yourself). Just by tweaking minor things like file names, link structure, and code layout, you can make a huge difference in your rankings. In other words, I agree wholeheartedly – yes, designers should have the basics of SEO down, and do them as a matter of course, not as an extra service! And BTW, thanks for listing “Splash Page” at the top of your do-not-do list. I saw one for the first time about 10 years ago, loved it for about five seconds, and can’t stand them ever since. Not only do they restrict your SEO, splash pages are self-indulgent and get between your reader and your content. Great guide, especially for someone who knows very little about SEO, I really learned a lot. You may want to reconsider the title though, as “designers” may be too specific – this guide is for everyone, not just designers. Well put… good article. I joined the SEO bandwagon 2 years ago and my business has more than tripled… not to mention that I don’t need to attend networking functions to drum up business. Also, if you don’t have an attachment to any sort of tracking software (which is half the battle of SEO), I strongly suggest you install google.com/analytics on a site and see how comprehensive it is. Thanks for the article… i just stumbled upon this site… i’ll be back. Very usefull article. Thank you! But i’ve an eternal problem with the splash pages. I live in belgium, wich is a country with 3 national languages. My clients often insist to have a “choose your language”-like homepage. What’s the best way to manage these kind of situation. Is there any “automatic” language redirection script ? Is this SEO Friendly ? Argh. Thank you for the seobook / wordtracker SEO keyword tips – I had totally forgotten about them…! Great post. I bookmark this for my clients when he ask me to make a splash screen for a new site!! Not only the humans surf the web. 24+365 the search engines, bots and other software try to put order at those we call internet. The correct use for the seo tools let us take advantage to make more visibility to find for other users. Great explain and good research. You’ve made so many Great points here, these should be make into a checklist for anyone wishing to gain some ground in the organic side of the engines. There are truly so many little points that add up to big factors, and when they’re not followed, your rankings just slip away leaving you wondering what happened. Thanks for also offering so many links to resources to help in the process. First time on this site and I’m very impressed. I’m learning about SEO also, and this article helps a lot! Thanks! This outline was very good for people are just becoming familiar with search engine optimization. Although this article is very clear, and concise, there are tons of techniques to improve a website’s position and search engine position. Very Useful Article………. Thx Man……. Good techniques for beginners, but there are lot of other factors which really need for good SEO. Actually, alt is wrong. You should be using longdesc for a description of the image, and Google definitely knows how to use longdesc. alt is the alternative to the image, not the description. Nick, I absolutely love this article and agree with you full heartedly that a succesfful designer is one who’s at least knowledgeable in the basics of SEO. Really nice article, great detail as always! 2 thumbs up. Keep up the great posts man! Cheers! Very Practical info. Simple and common sense article. This is a great piece of research on the search engine world of intrigue but i have questions are the links more important or the text I’m a newbie and just getting things in the right order links or more developmental text . Seo is more important than people can imagine..however, when a site is done well, the effects are immediately. Congratulations!! First of all thanks for sharing your knowledge about SEO. Today i read an article about SEO and now i complete all gaps with your post. From now i can make my web site a better one for search engines to get more visitors. Wow, can’t believe that 24% didn’t even know what SEO is. Thank you for this article and the links. Going to be using that Google Keyword Tool in the near future. Thank you very much for sharing these SEO ressources. tremendeously useful! It is interesting to see that 24% of designers did not know what search engine optimisation is. From a business perspective, I have seen a remarkable increase in SEO awareness amongst small businesses. We work on web design projects with diverse businesses mainly smaller businesses. Recently we have seen a big shift in awareness. Last year for some reason it took us a lot of convincing to make a small business realise the benefit of investing in an organic search engine optimisation campaign that we offer. However now a days often customer inquire themselves about how it can be achieved. Thank you very much, I am pleased to have found such a great resource! Good design without seo is nothing. You need to optimize the site to make profit on search engines. Wow – what a great article. I’m pretty new to web development, in fact I’m really just beggining to learn the basics. This is some very useful information for anyone who’s learning web design. I agree having a good design and good products doesnt help at all, one must know about seo, no traffic = no money. Thanks for this in depth article. thanks alot for this guide line however i would like to add one important information. Simply an Awesome blog post; thank you for posting it. Thanks. This was really helpful article. Your work ROCKS! Very useful tips. I always feel a little overwhelmed when it comes to SEO. This article definitely helped. very good article indeed! I like how you bound the importance of design with the cruciality of SEO. I think that far too many web designers aren’t profficient in terms of SEM and SEO and should probably take some sort of course to realise the importance of these domains. After all, combining knowledge of these techniques, applied with usable design will undoubtedly attract more clients, especially for small-medium companies and freelancers. Very good article. Thanks very much for the contribution. I have noticed many comments on a site that refers to this document for the subject of Ajax overuse. I think they are taken out of context with the point you are raising. This article should be very useful for designer who would like to focus on SEO. Great post. I’m a professional SEO and I was expecting to see an amateur take on SEO riddled with the nonsense myths that pervade SEO, instead I think that you pretty much nailed the important concepts, good job. My one comment would be that since you haven’t mentioned Competitive Keyword Research, that what you’re describing in this article is Search Engine Friendly design, rather than any form of SE Optimisation. Yes search engines will have no problem indexing pages built the way you’re recommending but actually ranking well for anything but non-competitive terms is a lot harder than just building SEF pages. It’s a start but it’s not SEO. i hate waiting. anyway to speed things up with the search engines? you think you could do a post on credible sources for seo help, like businesses that specialize in these types of things at a fair price and quality work, rather than taking all your money and dissapearing with no sign of change? would be a nice little investigative report. i’ve been looking for someone to help me out in this department. Very informative article, thanks for writing this. Nice article, very useful! I used some of these tips while designing for my clients, but I’ll definitely add a few more. This help a lot, thanks Nick! This helps a lot, thanks Nick! I agree with you, SEO is as important as you say. Thanks for your article. I have been looking for just this article. SEO is so simple yet the execution of the few things you are talking about with this blog post can make companies millions of dollars. I run the largest SEO company in the fourth largest city in the united states and I couldn’t have said it better. This article is just scratching the surface of SEO, however it is a well written blog that just shows you how much needs to be done to insure your site is visible to the world at large. Without search engines crawling your content and relaying potential clients/readers to you, no one would know you exist. Thanks you for a great refresher in the world of SEO. Nice tipe, you are going to make me have no more clients. As always, amazing quality and content and thanks a lot for the links to SEO resources, really good to have them in one place. Those tips are very useful and necessary to promote a website. I personally try to respect every little point of SEO so that I can get a high page rank and lots of relevant backlinks. Your SEO results tells well about how much you took care of it ! It’s one of the best I’ve seen for designers/beginners. Great information for all web designers, we should learn this and have in mind that the important thing in web design is not how beauty it looks, but how effective the website is. All the tips you give are very helpful, thanks for sharing this big imformation with all of us! Thanks for listing the resources, especially the seo resources. I must say “You have excellent technical writing skills”. It is one of the best SEO tutorials I’ve came across from so long. Unfortunatelly Google can’t index dynamic content, so if you have a xml-based website you won´t get most of the content indexed. Your Article open my eyes. which course I go for first. design OR SEO ? I will be obliged for your kind reply. As a SEO expert I think this is a great article for web a designer. I’ve came across may websites that has a great design, but no one can find it. Website marketing, as well as on-site optimization is fundamental in website development. wow, simple but deep article regarding SEO, never thought there are som many elements to improve your ste to the world, a simple blog (with localised contents like mine) can benefit (probably not world wide hehe :) ) much from this article. as a web designer you learn the importance of SEO and every design has be thought through to allow for this, SEO is one of the most important aspects of a web page especially for commercial use after all this is the google age. The article is very simple and very helpful not only to the web designer but also for those who are working in SEO too. Since i’m new to SEO, the article provides me a deep understanding about the SEO. Thanks for providing the excellent article. This is the best description/overview of SEO I have read :) thanks a lot! Shocking stats! As of today – I can hardly believe it – almost 20% wither don;t think SEO is required or don’t know what it is!!! Sorry, but OMG. Excellent article – I am working through point by point just to make sure I am doing everything I can for my, and my clients’ sites. Right on! I gotta implement these things for my site..thanks! Wow… how long did it take to write this article? Great job. Thank you so much for writing this :) Very Helpful. Great post! One thing I thought worth mentioning is that some AJAX-driven web sites have overcome the SEO obstacles by implementing code that allows a SE spider to find the content, yet it be displayed to visitors within the same page without reloading. Everyone just loves to put it on the designers desk! When I started waay back in 93 as a media designer, I was paid 35k right out of school. At that time I did a great deal of 2D design with a decent amount of 3D, which really set me apart. By 2001 I was making 120k, albeit after changing jobs 4 times. What I noticed was the job description evolved to such a point that I left the trade shortly after the really cool job because I was more than a little freaked out…I had to know programming, hardware, software (2D and 3D), firewalls, networking, and dont forget every designers favourite- Orifice and the damn outlook express not too mention cross platform issues for all the above, and the newest postscript ridiculousness. Bottom line: no, metatags and the like are NOT the designers forte, nor should they be. If a designer does turn out to be good at ‘…SEO…’ as you like to call it, they should get the heck out of that sweatshop where they are likely clearing $10/hr and go to work for themselves!! Thanks fot this article… really helpful!! Its really strange for me that 24% people on internet and even reading this post are saying they do not know “what is SEO”.Amazing for me! Anyway well written and thanks for focusing on design mistakes. Thanks! I love this post. I am currently in the SEO business but got my degree as a designer. I realize now, after my time in the seo world that the schools these designers go to don’t even teach search engine optimization at all. I am not surprised at the results of the pole. I handle sales for my company and find I have to carefully explain SEO to the regular business owner all the time. I loved this article, great help. I spent all day reworking my seo. Thanks!! i love the workpress design too. Thank you for the good help! Thanks for the article! Great help/read as usual. Great tutorial, I’m a complete css novice but this was easy to follow and tweak to suit my needs. A quick question: should the -900% text ident interfere with positioning the menu on the page? I seem to have to rely on absolute positioning coordinates, for example to center the menu next to an image at the top of my page. It’s true that splash pages are bad for users, SEO, and sales conversions. However, the search engines can now read Flash files (to a limited extent). i think even web designers must be aware on SEO. The designer should do this for his client. he should at least show care over his designs, besides, if the design went up to top spot on search engines, he will be one to be credited for it. Thanks for the article. Found it very helpful. Great article. I know that I’m not supposed to use the same title tag over and over again. However, my site was designed to have the same header above every page. The title tag is in this header. 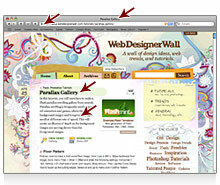 Can I delete the title tag from the header and insert a title tag into every page body of my website. Would this work? Thanks. SEO is sometimes tough! Unfortunately it’s becoming increasingly the case that on-site SEO isn’t anywhere near enough on it’s own and off-site SEO is a very grey area for most designers and even more so for clients. However at the very least on-site SEO should be sorted by the website creator. I just wanted to let you know of a blog I started to help SEO and SEM with Web Design Integration. It is relatively new but there are some pretty good posts up there now. . .Could help with those looking to go a bit more in depth with some of the topics you mention above. . . Thanks and keep on truckin with the great articles! As far as I recolect this is at first someone layed things out the way they suppose to be. The most accurate and proper one so far. Great Article, You did very superb job. It is really helpful for web designers. I was little bit worried about SEO, I just hear about SEO but now all things are cleared. Great Article! I work for the best web design firm located in NY called NoamDesign and it’s always great to stumble upon articles that help motivate, educate and inspire! Thanks! This was great information! I’m a graphic/front end web designer, and I just started taking an SEO course, and I love it. Your info was great reinforcement to my current knowledge and I know I’ll be back! Thanks, keep ’em coming! Thanks for the awesome guide mate, you have really cleared SEO up for me and now I am confident about what it is and how it works! Well, I think your websites are a prime example of how quality content that thousands, if not millions of people will be interested in, plus some good SEO practices can benefit your PageRank hugely. It is obvious to me that you have done a great job with your own SEO, and then you share information and tips, which has created a huge following, the result of which seems to be many important back links and high page ranking. Sometimes you have to give to gain… I love it! Well done man! Thanks for the advice. It really helped me! Wow thats something i have been looking for, easy and understandable. Goodwork. Thank you for the tips! I have made some changes and appreciate you sharing your knowledge. Your blog looks fantastic! It certainly adds credibility to your knowledge as does the fact that you rank on page 1! Great post! I’ve been working as a search engine optimizer for 4 years and I really enjoyed founding that designers are also interested with SEO (even if you found someone who does not know what it is about =) ). Always remember that content rules: if you write useful and brand new contents, your popularity will automatically increase. And what about technical aspects? Just follow W3C and usability standards, you will be surprised! I’m japanese search engine optimizer. The entry was a nice information. great article for Web Designers and Developer……..i will try to implement in my next site. buena info!, aunque todo esta en ingles :-s, igual me servirá bastante. Great Post. You have given me a new perspective on SEO. I will use many of these practices in upcoming projects. Thank you. Very well written! I was taught SEO by an accessibility nut. I sort of had to adhere to these concepts out of the gate…. It’s great to see them presented from a design perspective. It has always seemed like good practice to me. I am not exactly sure how I wound up on this page, I clicked a few links to get here. This site is quite cool. I love the graphics. A friend of mine forwarded an outline for a prospective job that asked for “very strong writing skills — particularly in the on-line world (incorporating SEO)” Since I didn’t know what SEO was I googled it and found this site. Thank you so much! I learned a lot and I will certainly use this site again– especially if I get the job. Wish me luck. We are in the process of redesigning our web site. This information will be very helpful. Thanks, it’s so important to build sites that search engines can read. I’m far from an seo expert, but i try to help out my clients when I build the site, and information is definitely in my bookmarks. I really enjoy reading your stuff Nick, keep up the good work pal. This is one of the best explanations about SEO on the web! Its not surprising considering this website is one of the top 10 (imhp) best website out there. Its good to see real info about SEO unlike other sites which either fib about it or are trying to sell you something. Great Tutorial…TQ So Much…. It would helpful on my picture based website… TQ..
sir i have experiance for 6 mon for seo development so any requirement for that job, so plz tell me. This Article is very good which tell me about “SEO” , thanks for helpful information. firstly i wanna say “thank you” becouse this is an useful article. i have learned lots of thing from it. Very Impressive article – Useful for many designers and developers. Thanks buddy! This is some of the most honest content on SEO that I have found out there. Nice Work! Thanks you this was a very helpful and useful article… For those of us who are a little new at this and still struggleing with the concepts, it seemed to clearly lay out the subjec in terms that even I could understand. Sincerely appreciate the time and effort that went into keeping it understandable and basic, for us beginners. Thanks for this excellent and informative post. As an advertising agency we work with lots of designers that don’t pay any attention to SEO at the design stages, which as you highlight in your article is rather a lot. I’ve been reading a lot of articles across the web and this one by far is the best one for designers. I forgot to mention I have had great success using a lot of these techniques for my site and have had a 950% increase in traffic in 3 months according to Alexa, which I think is due to a number of factors including hard work on my site, as well as research, and this article really helped so thank you thank you! I have even had some of my clients pointing out sites that have copied my site, which is upseting, but then I remembered how many people copy this site and I felt better! Thanks a lot for this information, i found out that i have done a few mistakes in my site as well, lol, going to fix it now . I agree that SEO is very important to webmasters. It can help to increase traffic, make profits, and help with the marketing. Thank you for this great post. It is really true that all webmasters should master SEO to succeed. We got hit with a 2 point drop as well, from 6 to 4. We’re not about to remove our text links though until Google steps up and explains their reasoning behind the drop. Hello all’s it is realy too good that SEO Guide for Designers and very useful infomation about the How Search Engines Work i feel that it is adopted work for each SEO Persons. Devanga Vivaha.com is an exclusive matrimonial portal for Telugu Devanga community people across India. The portal has the exclusive members who belong to Telugu Devanga community and is interested in matrimonial services. I red a lot about SEO and SEM. Trust me you wrote a professional article. not only a complete description but also easy to understand. I enjoyed this post immensely! SEO was a lot easier to understand the way you put it! Found you through Dynamic Graphics Magazine! awesome! Ps. Can Search Engines get to information in Spry Collapsible Panels? Informative article. Really surprised that most designers do not think this is crucial. a good pr website( pr-3) ads space are available for sell just in $10 you can put your add here for life time in $100 and $10 for a month. SEO, as a profession, is bull. A well-designed site with well-designed content should stand on its own. A search engine, by its very nature, should be able to parse that site without aid. The above are very good tips – practices which should be employed BY THE DESIGNER and BY THE CONTENT MANAGER. SEO should not be a job title. Check out the collapsible panels by clicking here. Hi yea, It would be great if you had a place on your site to download a pdf of all the latest info, something of a newspaper come book, If it had a pay here buttun and you were charging 10 odd quid for it I would get it every so often thus I can read it when I have a pint at home. I sometimes find for educational purpose studying on the net is too much for me, I like to print n paper and have a good read and use highlighter etc. Awesome information! I really appreciated it and looking for some new updates. Excellent article….. Your writing skill has encouraged me. The way you have written is very simple and anyone can understand it easily. These tips are really very much useful for the new designers and developers. Thanks for writing such wonderful article. I will definitely share this link with my friends. Only in the last 12 months has it become very clear to me that SEO is very important, so much so that I now spend a lot of my time on it. I have come accross several SEO guides recently, and this one is among the better ones, so thanks for compiling it. So many businesses and websites are scrambling these days to get generate leads and more and more are realizing the importance of SEO, so this post will likely become very popular. Excellent article. There are a lot of things I never even thought about. Thanks for the links as well. Great job! This is a great article! This (in-short) details many of the intricacies of a good Search Engine Optimization Campaign. You can definitely tell you put a lot of thought, time, and effort into this. As a professional SEO, I must say you clearly know your stuff! SEO is simply designing your website to the needs of your customers, tailoring the experience to their type of search. Before you start any website design project, you should understand your target audience and what they are looking for. When Breitling, which opened its doors for the first time is Switzerland in 1884, decides to release a new timepiece, the rest of the watch world, fans and competitors alike, pays close attention. Well here it is. The Breitling Caliber B01. The article is very precise and very informative, it is useful for designer as well as SEO webmaster. Many things were not known to me earlier, thanks for the informative article. Very informative and well organised informations for SEO. Thanks. Thats was a very informative article. Well written. I agree with you, SEO isn’t only for online marketers. As a web designer or frontend developer, most on-site SEO is your responsibility. I do like the part about samantic code, its very important! nice article. I am really just learning SEO, and know how important it really. It looks like there are a lot of resources here that I will want to revisit at some point. Thanks for sharing your input on the topic. Great article about SEO. very informative. Very informative article Bob. However, I think a major SEO analysis tool you missed was SpyderMate. It’s free with a lot of graphics and statistics, plus it gives you the option to compare your site against competitors. Great post. SEO is something I believe every web designer must take seriously to be able to provide quality service to clients. Really serious and detailed article. I’ve read a lot of guides and manuals and by far this one owns them all =) SEO nowadays is very important …I’d call it VITALLY important thing so clear understanding of all basic rules and requirements is really what a great deal of SEO guys lack…. SEO is something I believe every web designer must take seriously to be able to provide quality service . Thanks for a great information. Being an SEO Professional, I have been looking for some core fundamentals of Development and design with SEO prespective. These guidelines are good enough to help most of us. i would like to know if it is possible for me to design a search engine that load html pages on a specified area in another html page in the same site. if yes, please i want an answer to this question. if possible. Excellent post, confirms most of my basic practices when building websites. For really good designer it’s perfect. This is a very well written and informative post. Certainly worth linking to. Really cool article. Great help. Much appreciated. Excellent post and great summary of SEO. I recently engaged some of the best practices you outlined in your post and I have lifted my online visibility and web site grade by over 33%. What’s even more interesting is that another designer I know who is a described web pro has a web site that is 80% less effective at SEO than my site. I will continue to implement these practices and hope to lift my online visibility and site grade even higher. Thanks again for your insights. very nice site, Thanks for your seo tips! Very good very nice site, Thanks for your seo tips! GREAT ARTICLE AND GOOD RESEARCH!!!! hey nice post. Really helpful. I have a query.. I made website for a dance academy. Now this class has a huge name (around 45 characters with spaces). while giving individual page titles, should i append the academy’s name at the end? Or should i simply not bother about it..? We also have a nice 5 character abbreviation for the academy. But its not well-known. Hence isn’t anywhere on the web. Should I introduce that on the home page and use it in Page Titles? Maybe one can’t say for sure, but i hope u can help..
Great information, Thank you for sharing with some of us who have not a clue, but with your article the fog is starting to lift. seo friendly website design will help search engine to crawl pages asap. I have visited many web sites and I learned that most of people are not focusing on SEO while they are designing.Lot of highly ranked sites shows no results in Google search engine.Many web sites have a very good content but due to their ignorance about SEO.They failed to share their sites in search engine results.On the other hand Spammer are getting very good traffic.So Sad. This was very helpful information and very useful. I think every web designer or developer should have knowledge in building search engine friendly websites. Basic SEO is needed. Really serious and detailed article. Thank you so much for writing this helpful guide! I have bookmarked this, and will undoubtedly use it as a reference in the future. I really appreciate for ahead to seo teaching… with guiders. thanks many meet again. Thanks many for sharing seo free tolls list.. meet again. one online tool that could and can help webmasters is http://ministatus.com. it returns various results related to SEO and SMO as well as a price evaluation of the queried domain. my company is looking for smart & brilliant w-designer and seo for a couple of websites. Hotel Market. I would be happy if you can get in touch. monies earned through the internet increases, people in search engines to attract visitors to the site they wanted to raise. it has occurred as a result of the seo. For those who want to apply to the seo site was a beautiful expression. Hey, great information for me i would have to say i would be shocked if i heard a developer tell me that they don’t know what SEO is by now. Great Post. Look at this great seo too. Thanks you for this great information. This is really interessting. It is possible to get this information as PDF or a presentation (to show my collegues)? Some excellent tips, I always get annoyed with designers coming up with designs that can’t be replicated, I wouldn’t even dare try to ask them to consider SEO but I guess I can only hope… one day maybe. I always appreciate such article, please keep it up. wow gr8 post….. happy to see this type of tips…. I am designer.therefore i like it. I got it! SEO is really important for Online business and in web designing too. Thanks for your great web seo guide and tips for desgners. Please keep up your good work. I used to have a big discussion with my students in regards to a Splash page too. Have never really understood them. Thank you so much! I’ve been passing your site around to my colleagues and they find it very helpful. I tend to garble everything in SEO speak which is hard to understand. Thank you so much for the clear explanation and information. It’s really helpful for me especially for the website that I’m trying to improve on search engine crawling. An artistic mind (developer) coupled with the knowledge to make the numbers (SEO) is a powerful combination. Thanks for the post. Yes for high page rankings you definitely aSearch Engine friendly website, lots quality content with tons of relevant back links. That is what SEO is all about. It works for web designers, SEO marketers and site owners. Thanks for the “SEO Guide for Designers” tips. I really liked it. Nice post. I perform the SEO for the company and I work for and this is a lot of solid info. One thing on keyword density though, it actually isn’t measured by the search engines anymore. It is important to have a keyword appear through out your content but it is more important for your site to be useful to the user. So trying to maintain an a certain percentage won’t help you. Just make sure the content flows naturally and is as informative as possible. After all a user liking your site and sharing it/linking to it on their own site will have more of an impact on traffic than mentioning a keyword a couple more times. This is one of the best guides that i ever readed, it is full of really good informations and tips; also, i believe that a SEO specialist must have acknowledges of web design, as much as a web designer must know hot to optimize his creation (horse=SEO, carriage=Website). SEO is working from here also. so I like to write about my businees little bit. you can submit your webdetails in youtube.com, buddytv.com, like that. Emerald, tanzanite, ruby, sapphire, precious, semiprecious, gemstone, Diamond and Gold jewelry. Thank you. You have provided some great tips for SEO. I am also self-taught and so I am always looking to improve my sites usability for customers and readability for search engines. thank you so much for sharing this information with us, it is pretty interesting. Thank you for such a good article!, it was very useful for me. Although I was informed about some things, its a very clean and clarifier article. Thanks for posting such an informative post. This post will surely be helpful for a beginer to an expert level. Web Designer and Developers will get a clear picture about how the websites should be designed from the SEO point of view. very useful and understandable article,thanks. And ı want to add that ” Seo is a race which countinues forever.the web sites are like babies,you should show attention to them always. your post is very useful for that who is in-trusted in web designing.SEO is very useful technique.Am also working on SEO technique and the concept of SEO is clear in mind. Thanks for sharing to us your post. I think that yes Designing is the base of SEO. Without designing SEO has no meaning or I must say that without it SEO can’t exist. This post is a must to be read by all web designers, developers, seo and website owners. Many websites continues to use unfriendly URL. instead they could use mod rewrite and have SEO friendly URLs. Thanks for posting such an informative post. This post will surely be helpful for a beginer to an expert level. Websites need to use friendly URL so that is crawled easily by the engines. This a really good article, thanks for this info. that results very useful. That’s a great article. It covers all the basics of good SEO work without blinding the reader with too much detail. It’s an awesome article. These are things should keep in mind while you designing a website for easy promotion. Thanks for sharing. Great article! Every designer should take something from it, because designs I see mostly shows how designer has no idea about SEO! This is a really good article I have ever read regarding SEO, thanks for sharing such a nice information. That results very useful. Thank you for the tips here. Great advice. Really very important points whatever you have shared. If you would like to see your website on higher level in search engines then you must take care about all these points and also make your website more search engine friendly. Thanks for upgrading my knowledge on SEO. great article, i’m sending this along to our in-house dev and creative teams! the best part is this: SEO isn’t only for online marketers. As a web designer or frontend developer, most on-site SEO is your responsibility. increible! para ternerlo siempre en cuenta! this really helped me a lot with a project in my web design class, thanks. Um, not sure I agree to what was mentioned. I guess everyone has their own opinion I guess. Easy to understand and to follow. Recommended for SEO newbies and a good refresher to everyone! Thanks for sharing! This was a great article! Thanks for sharing! Although I have learned about SEO before, this was a great reminder and refreshing. I agree 100% that SEO is very important with the design & development of websites. Anymore there are so many ways for people to just get their own websites by using templates, but what they do not realize is they are lacking SEO. Offering SEO as a service can definitely give a web designer or developer and edge. great article!!! very informative.Thanks for sharing this. So you think you are not an expert in the SEO field? Well, you are wrong! Your step-by-step SEO guide is not only suitable for pros and newbies alike but it also features unique points not mentioned anywhere else. Thank you for sharing your SEM knowledge with the community. Your step-by-step SEO guide is not only suitable for pros and newbies alike but it also features a few unique points not mentioned anywhere else. This was a great article! Thanks for sharing! Although I have learned about SEO before, this was a great reminder and refreshing. I agree 100% that SEO is very important with the design & development of websites. I found your article and posts most fascinating,informative and useful. Thanks so much. How do i SEO a Search Page? I’ve designing a search engine for designers http://www.flevr.com . There isn’t anything other than a logo and a search box on the page. Great post. It really is about the hidden art of SEO. Seamless integration and working with the site to provide users needs first and Google second. Pretty cool article…it’s suited for beginners in SEO. What I want to ask is this: ajax menus are SEO friendly ? If not, then which kind of menus can be SEO Friendly and some kind dropmenu for a website ? Amazingly helpful article, just like all other ones I always read here. I found out that SitePoint also launched their own SEO guide book an offering free chapters. You can check it out and see if it is worthy. great seo guide for the designers. Thanks for the upload. Keyword density is an important factor to consider when writing an article. However, the real important thing is to make sure that the article makes sense, that is easy to read and most importantly, enjoyable and useful. Search engine optimisation is tough cookie. I am reading everything I can get my hands on. I even wrote my own article Testing, Tracking & Optimization. I hope you are right about long waiting time cause I cant see any results. Thx for sharing. Thanks a lot for your information… its really very helpful for me.Can you give me some simple information on the On-Page Optimization. Link wheel tactics can bring very good ranks in search engine position. My plaxo profile site links are few examples of link selection ideas. This is really good information. Web designers’ clients generally don’t understand the concept of SEO but expect that their website is going to get good search rankings. Web designers need to read up on this. SEO outsourcing is a nice option too. Great post. I like the crash course style, and using your personal webpage as an example of why getting organic traffic is a good thing. to print your own personal photobook. We provide you custom printing service on Catalogue, Thesis, Company Profile, Menu, Corporate newsletter… etc. Our company emphasized on people who wants to create their ideas and creativity on print media. Let your sweet moment becomes memorable moment in future, we make sweet moment valuable. In today’s world SEO is absolutely imperative. If your business can not be found online you’re losing out on potential customers. Grand Valley Marketing specializes in SEO and other online marketing aspects to help businesses get found by potential customers wherever they may be searching online. http://www.GrandValleyMarketing.com offers affordable, effective online marketing for small and local businesses. I am a SEO specialist and authority in the field of search engines. I work transparently with web designers all over the US. If you need a reliable SEO expert to back your web designs, I am your guy. Great for your team! Just wondering if you design website and know about seo.I am a Life Coach and in the process of trying to get a web page designed.I would like to get the most out of my web page as like the talk in this forum.Do you have a web page with info I can view your work? http://www.regalwebsitedesign.com what would you do to get it highter on google? I have worked on a load of web design projects for my clients and almost all of them were interested in ranking well inside Google, yahoo and bing. There is a lot you can do to improve the search optimisation of your website through the design, but also through the structure of the website too. I agree with Stu, alot of our clients see SEO as some mystical practice. I think education is the key to helping them understand. This takes time but the end reward is a customer willing to spend money where they can see value. Fantastic information I have just started up an SEO blog, non profit I am providing advice for free, I consider myself pretty good with SEO but I am always learning. Great content I really appreciate it thank you. well i see that seo is the most important of a site to get traffic that’s why i choose http://www.buyfcbkfans.com to seo my site. Great job!. I am searching this type of articles regarding SEO. Thank you again dear Admin….. In my opinion, when the visitor meet a nice tricks about design they will come again to check the newest post, subscribe to it, or maybe share in social media. I apprectaie you taking to time to contribute That’s very helpful. Overall Im rather impressed with this blog and the article is excellent guide for me. Wow. very impressive with your article, it mark down to very small details that a web designer should look out for in terms of basics to advanced SEO techniques. Very nice post thanks 4 shearing with us.. I also consider that overuse of Ajax in site can surely cause decrements in ranking. Because if we make overuse of ajax to make effective navigation, Google will not be able to crawl site dynamic pages that results decrements in ranking. Extremely well written post, I stumbled upon your article while I was checking some info on Keyword Density and how many times I must repeat a keyword in an article/post. I was under the impression that I can use 2 to 3% of keyword density, but it’s a news to know that it’s not safe to use more than 3 times in an article. Thanks a lot. I just want to thank you for sharing your knowledge. I hope one day I will be able to do the same. Thanks. i just want say it, thanks and pleasure, . so more thanks for your sharing knowledge….i more enjoy that this lession………..
Good post as always. I think your gave the skinny on SEO all in one post! I am sure you save many people countless hours of book reading and internet research. Actually I think you highlighted just about everything you would get in an SEO book you buy at the store. If only I found this post years ago, haha. I was under the impression that I can use 2 to 3% of keyword density, but it’s a news to know that it’s not safe to use more than 3 times in an article. Thanks a lot. You spent a lot of time in writing this post. Certainly it does provide some useful insights for a web designer who wishes to design a search engine friendly website. well as a beginner this article is informative for me…. thanks for sharing such a useful information.. Extremely well written post, I stumbled upon your article while I was checking some info on Keyword Density and how many times I must repeat a keyword in an article/post. I was under the impression that I can use 2 to 3% of keyword density, but it’s a news to know that it’s not safe to use more than 3 times in an article. Broken links are very important. Many website owners forget that. Many don’t give importance to internal links too. Thanks. Your tips are very nice….If u waant Top Real Estate company Nellore, Real Estate, Real Estate Plot, Real Estate Flat, Real Estate Plots, Real Estate Flats. Plots Nellore, Duplex house Nellore, Flats Nellore, Plot Nellore, Flat Nellore, Real Estate Nellore, Realtors in Nellore please visit my website for query…. your RSS. I don’t understand why I can’t join it. Is there anybody having identical RSS issues? Anyone who knows the solution will you kindly respond? Thanks!! howto use keywork array ? I stumbled upon your article while I was checking some info on Keyword Density and how many times I must repeat a keyword in an article/post. I was under the impression that I can use 2 to 3% of keyword density, but it’s a news to know that it’s not safe to use more than 3 times in an article. How we use SEO and social media have changed…. Nice one! I recently wrote a fresh post about SEO and Web Design. Most of the things here still makes sense, but it’s an area where things keep changing, as search engines keep updating the algorithms. I think your gave the skinny on SEO all in one post! I am sure you save many people countless hours of book reading and internet research. Thanks for all your help. How can I reward you? Thanks for the insight, I bookmarked your this article for further review on my site. Allow me to drop a link on my comment. Thanks for this! Interesting read that covers all the basics but, What if you to ‘SEO’ a website that sells ‘SEO’ ? Where do you start?? A brief introduction on seo, this introduction contains all the information about seo. Can you tell me what are new technologies uses in SEO. Knowledge about SEO is very important for web designers. Creating search engine friendly websites with eye catchy designs helps improve search engine exposure and better rankings. Most Interesting and valuable information. I do love the fact there is always a wealth of free valuable information available if one is prepared to do a little bit of work i.e. search for it. All of the fore mentioned is great advise for the experienced and novice alike. I would only add – never lose sight of the fact: People are on your page because they believe you just might have Relevant, valuable and quality information in relation to what they are searching for. That is your priority task and then all of the seo worked mentioned on this page to complete the job. Which is an ongoing job along with regular updates to your site’s content. In closing, even though you can use free and premium tools to help you promote your site you must prepare yourself for extensive effort and commitment if you wish to succeed! Good post! In nowadays, SEO and UX are very related. UX directly impacts dwell time, bounce rate and the most important – Conversion RATE. One resource for SEO that really should be listed here is Source University. It’s one of the few courses out there that have teachers that make their money from their own skills versus just teaching and it has the most success stories compared to any other courses.